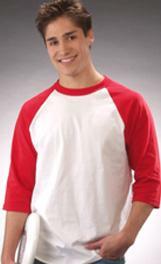 4.9 oz., 50% cotton/50% polyester, ribbed V-neck trim, stripes on set-in sleeves. 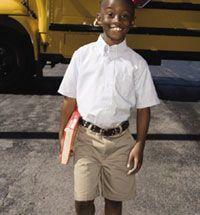 55% cotton/45% polyester boy's flat front twill short. Easy-care WrinkleNoMore fabric. Polished hook and eye closure. Dyed-to-match zipper. Tailored belt loops. Side-seam pockets. Clean finish pocket entry. Clean welt pocket in back. 55% cotton/45% polyester boy's flat front twill short. Easy-care WrinkleNoMore fabric. Polished hook and eye closure. Dyed-to-match zipper. Tailored belt loops. Side-seam pockets. Clean finish pocket entry. Clean welt pocket in back. 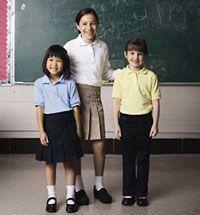 Husky sizing is typically three inches wider in the waist and hips for a more generous fit. 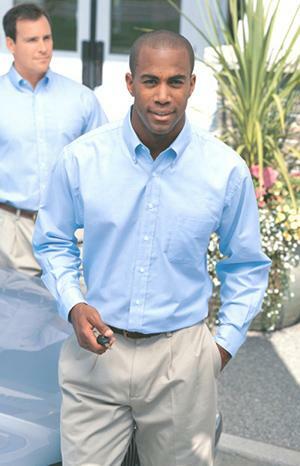 4.3-ounce, 60/40 cotton/poly; back pleat, tuck-in tails, pearlized buttons. 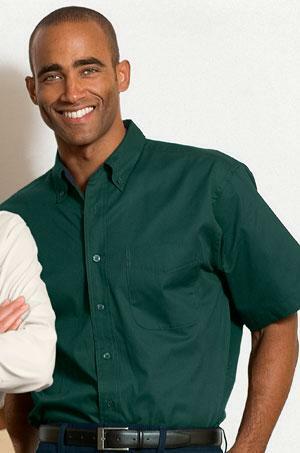 Features a traditional button-down collar and single patch pocket. Double-needle hemmed at the sleeve cuffs. 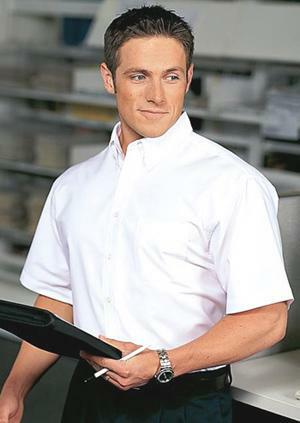 4.3-ounce, 60/40 cotton/poly; back pleat, tuck-in tails, pearlized buttons; button-through sleeve plackets. 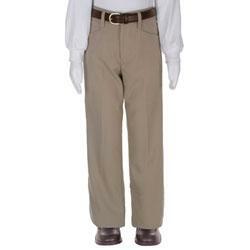 Features a traditional button-down collar and single patch pocket. 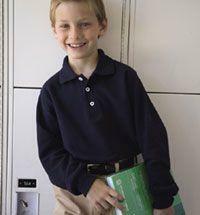 60% cotton/40% polyester boy's flat front twill pant. Easy-care WrinkleNoMore fabric. Polished hook and eye closure. Dyed-to-match zipper. Comfy grow waistband. Tailored belt loops. Fully finished pocket entry. Oversized fused and stitched double-knee linings. 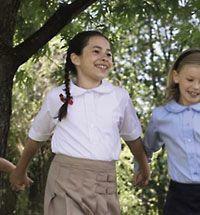 65% cotton/35% polyester girl's flat front twill pant. Easy-care WrinkleNoMore fabric. Polished hook and eye closure. Contoured waistband. Slash pockets with mock coin pocket detail. Bootleg cut. Slight drop at waist for comfort. 65% cotton/35% polyester girl's flat front twill pant. Easy-care WrinkleNoMore fabric. Polished hook and eye closure. Contoured waistband. Slash pockets with mock coin pocket detail. Bootleg cut. Slight drop at waist for comfort. Plus sizes are typically three inches wider in the waist and hips for a more generous fit. 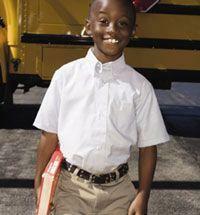 60% cotton/40% polyester boy's flat front twill pant. Easy-care WrinkleNoMore fabric. Polished hook and eye closure. Dyed-to-match zipper. Comfy grow waistband. Tailored belt loops. Fully finished pocket entry. Oversized fused and stitched double-knee linings. Husky sizing is typically three inches wider in the waist and hips for a more generous fit.